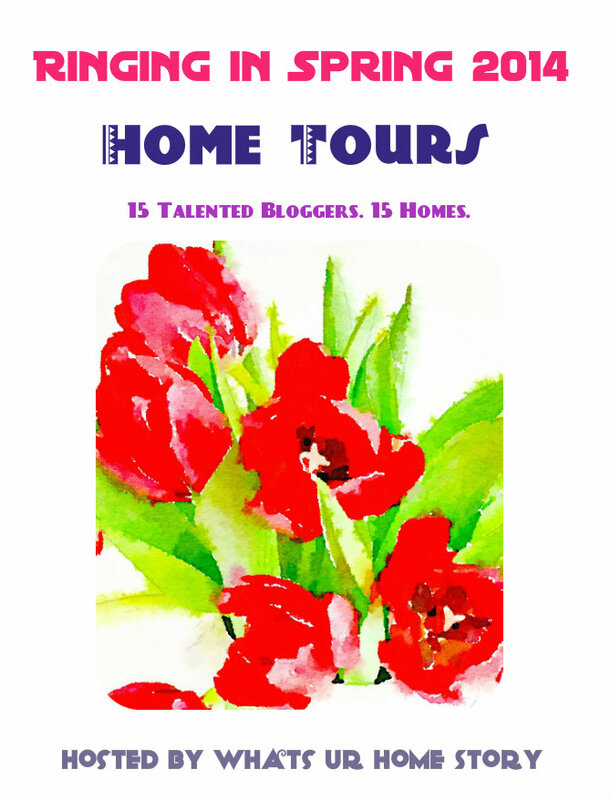 The Collected Interior: Spring Tour of Homes! 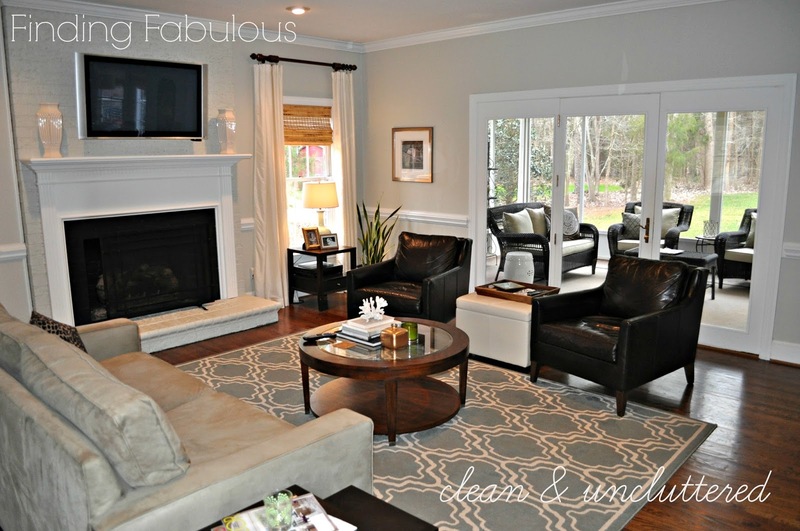 This is our family room below that we actually just gave a total room makeover with simple paint. 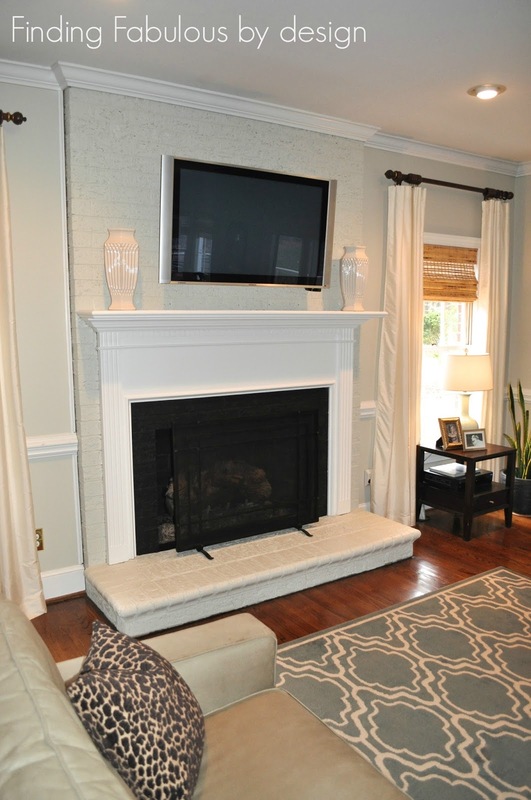 We painted the walls a cool gray - SW Useful Gray and even painted our dark red brick fireplace the same color as the wall. We also added a new gray/blue rug in a fun pattern for a whole new lighter look that is perfect for Spring. Click here to see the very dark Before, you won't believe the difference a little paint can make. Now to be honest, I'm not a flower girl. I love them outside, but I only use cut flowers in vases on special occasions. But I do love a few potted plants and other nature inspired accessories in our home. Looking at my mantle I'd say I'm a minimalist. I also love clean lines mixed with bold patterns. This lamp below used to be bright turquoise which didn't coordinate well with our new gray/blue color scheme. So I revamped my lamp and spray painted it in Valspar's Color Radiance in the color Mellow Spring. I love this fresh new color. This picture below shows our entire family room and how it flows straight out onto our screened porch. A year ago these french doors had mullions. I removed the mullions for a cleaner and more modern look. This has been my favorite change in this space because with the glass doors open, it's brought the outside in, and the view of our half acre wooded back yard is wonderful! Here's our screened porch below. I recently added a little color with these fun pouffs from Target. On Spring and Summer evenings our whole family hangs out here. 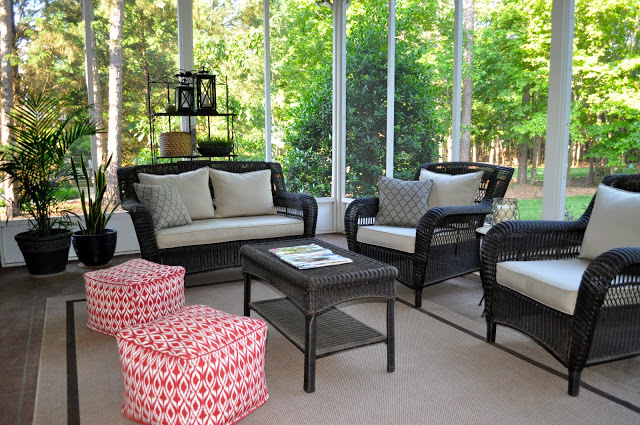 We simply love our screened porch! And then straight behind our screened porch and nestled near the woods is our Diy Fire pit! This is a fire pit kit that we bought from Home Depot (on-line only) and is very affordable. We enjoy our fire pit with our family and friends mainly in the Fall and Spring. And finally here are a few of my favorite plants that I pot every Spring! I flank our screened porch with simple ferns and they thrive in this shady area. Literally they live from Spring straight through to Fall! 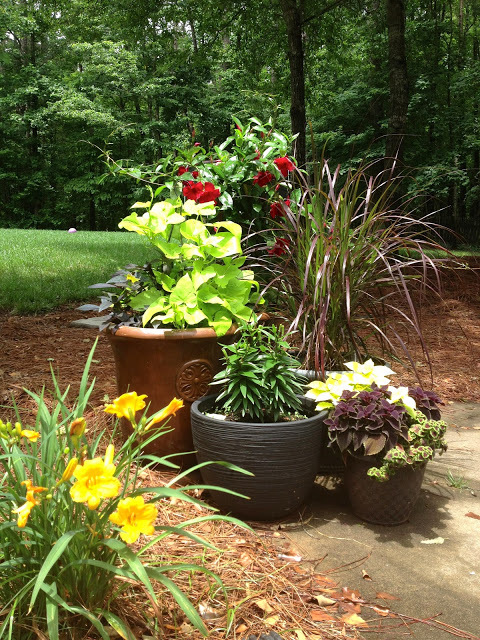 And then in the corner of our driveway I use Lilly's, sweet potato vine, coleus and I even pot a grass plant. Okay guys that's what Spring looks like around our home. I really love minimal design that's light and airy, as well as an eclectic mix of many different styles. Also creating comfortable outdoor spaces makes getting outside much more enjoyable when the warm weather finally arrives. Okay who's got Spring fever? I sure do. Give these gals above a shout, and check out their fabulous Spring style! Thank you Kathy! You should totally try removing those mullions. Especially if your looking for a cleaner and more modern look. And now is the perfect time of year to do it! Let me know if you do it...I'd love to see the before & After. Thanks Lisa, isn't Amazing what a little paint can do! 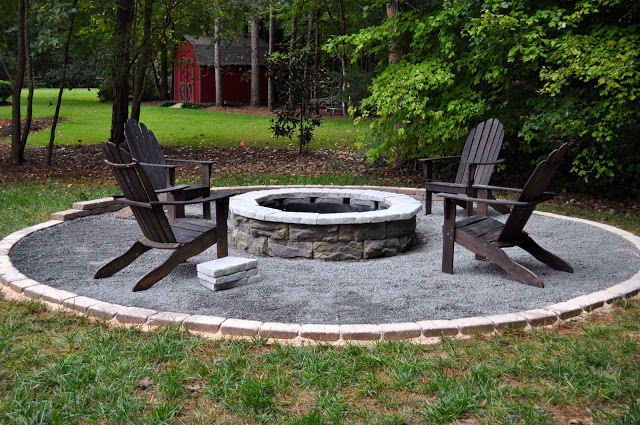 That Diy fire pit is our favorite place to hang on chilly evenings. And when it's warm outside, we goto the screened porch. Funny that you mentioned pea sized gravel. The hubby and I are so glad we chose small gravel because when you walk on it, it doesn't slip around. I also love the dark gray color. And yes the kids helped with the project and it was fun for everyone! Totally agree on the power of paint. 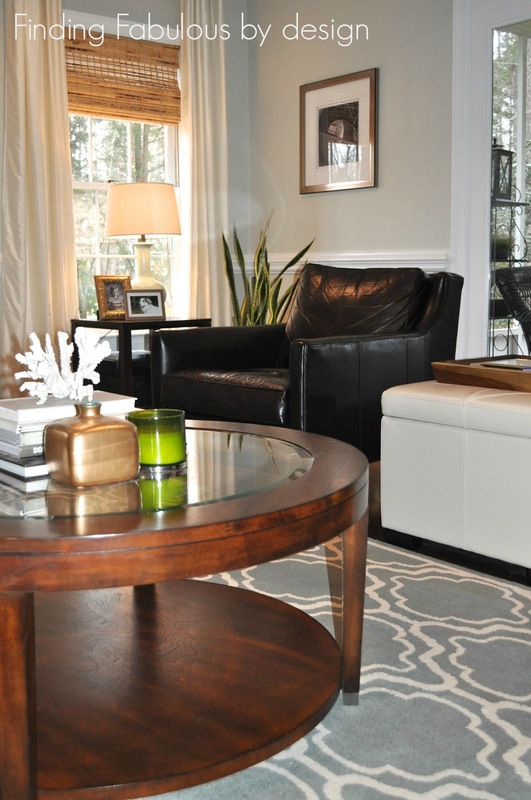 The gray color you chose is perfect, fresh and modern. The back yard looks fabulous too. Thanks for being part of the tour, Jane. It has been so fun to see everyone's take on Spring. Thanks for including me Vidya, it was fun!! oh, I can't wait to get out and plant flowers! About to repaint our home in a light gray too - love yours! Had fun being in the tour with you! Thanks Kris, we do love our screened porch! Can't wait until its warm enough to really use again! Oh, I'm so in love with your blue rug, it's gorgeous! Thanks for the tour! Beautiful home! The color scheme, porch, and the gorgeous backdrop! Wow. What lovely spaces you have inside and out Spring weather! Thanks for sharing your Spring Tour! I'm in NC and one day is sunny and the next is freezing! ugh..